Ed Sheeran is one of the biggest singer/songwriters going right now, writing for everyone from Taylor Swift to Rihanna to his own hits such as 2014’s “Thinking Out Loud”. However, he’s been on a two year hiatus since the release of his 2014 Grammy nominated album X. In late 2015 he said goodbye to social media and stopped making public appearances. Then on January 6, 2017, he surprised the world with brand new music, and just a few short weeks later in early February, he dropped the music video for “Shape Of You”, which debuted at #1 on the Billboard Hot 100 and amassed over 80 million views in its first 10 days on Youtube. Ed, wearing black high top chucks, and Jennie walking down the street. The song, which he stated was originally written for Rihanna, is much different from Sheeran’s previous music. You can tell that during his hiatus he has been experimenting with a different sound. However, it’s not different enough that you would think, “Oh that’s not an Ed Sheeran song”. It’s different yet familiar, and it fits his voice. Sheeran’s vocals are the primary focus here, with nothing more some percussive guitar and a beat that consists of some subtle marimba hits to back him. The lyrics recount Ed gaining a strong lust for a girl at a bar, and falling for her body. He actually falls for her personality too, but in the end, he’s all about her body. The song’s composition is a welcomed twist for Sheeran’s music, as it’s really like nothing he’s ever done before. No better shoe to go on a heartbroken run in. The video features Ed working out at a boxing gym, training for what appears to be a big fight. There’s a girl (played by Jennie Pegouskie) who is also training, and after she accidentally slams her locker door in his face, they hang out. They go out for lunch, and end up dating. Everything seems to be going great. They workout together, and seem to definitely be developing a strong connection. However, that changes when she mysteriously leaves, only leaving behind a picture of an unknown building and a blue mouthguard that features a division symbol on it. 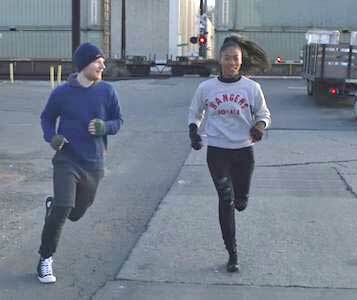 Ed keeps training, angrily running in a pair of black chucks up and down the train tracks where he and Jennie use to do the same. The building turns out to be an underground sumo wrestling ring, and, while there, Ed ends up fighting retired wrestler Yamamotoyama Ryūta. He loses of course, but as he’s getting dragged out by Yama, Jennie shows up and flies through the air to kick the fighter in the face as the screen cuts to black. The video ends with Ed flopping on the floor in his sumo outfit as the credits roll. It’s a nice video that accentuates the focus on the human body, while at the same time showing that there is more than just lust in their relationship. Couples that train together, win together. Get a new pair of chucks to work out in by clicking on the links below.